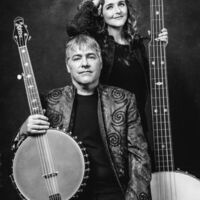 Béla Fleck and Abigail Washburn, “the king and queen of the banjo” (Paste Magazine), have a musical partnership unlike any other. With one eye on using the banjo to showcase America’s rich heritage and the other pulling this humble instrument into new and unique realms, these two artists are simultaneously familiar and wildly innovative. Fleck is a 16-time Grammy Award winner who has taken the instrument across multiple genres with his jazz-to-classical ingenuity and bluegrass roots. Washburn has the earthy sophistication of a postmodern, old-time singer-songwriter, and has revolutionized the clawhammer banjo by combining it with Far East culture and sounds. “Their marriage… officially harmonized two of the instrument’s finest players” (Chicago Tribune), and the pair took home a 2016 Grammy Award for their self-titled debut. When their distinct musical personalities and banjo styles interact, they’ve got the world on a string.